Is a mail order bride still a thing? At least for anyone who doesn’t have designs on US citizenship? Like a python, you’d have to dislocate your jaw to swallow a premise this stupid. Here comes Secrets of a Psychopath, the latest offering (after a long long long hiatus) from genre legend Bert I. Gordon (Empire of the Ants). And boy, is this one dumb as dumb can be. It wants you to believe, in this day and age, people get married without after having actually met —and no, these aren’t South Asians or Amish — but two run-of-the-mill small town Texans. Young, very attractive Grace (Mary Anthony) shows up with a suitcase on innocent Henry’s front porch. Henry (Mark Famiglietti) is a good-looking recluse who’s inherited a creepy mansion with his sister Catherine. Henry and Grace suss each other out while Grace explores her new home and then presses, “don’t you even want to kiss me, given we’re going to be married soon?” or some such thing. Henry takes to the web again, in order to secure another victim, this time an unemployed realtor he baits with the promise of a job opportunity in his small town of Bedford. They meet at a real estate office and he offers to drive her to the meeting, because hopping in a stranger’s car you’ve never seen – who’s offered you a job sight unseen – and driving out to some remote locale is normal behavior. Then again, she doesn’t hurl herself out of the moving vehicle when, in answer to her question, “What do you do for a living?” he mumbles that he “teaches psychology,” but refuses to provide details as to where. Psycho Henry has a backstory: he’s impotent and can only perform in the loving arms of his sister Catherine but is understandably wracked with guilt over that. He favors sitting outside for hours on a rocking chair, consumed with thoughts about his siblings who died in a backyard drowning mishap. Oh, and Henry and Catherine like to play dress up: he as some kind of Little Lord Fauntleroy and she as a bizarre doll-like Shirley Temple. Together they recite creepy nursery rhymes. It’s a thrill to see Bert I. Gordon making films again, especially as he’s well into his 90s and was behind Master of the Puppet People and Food of the Gods. 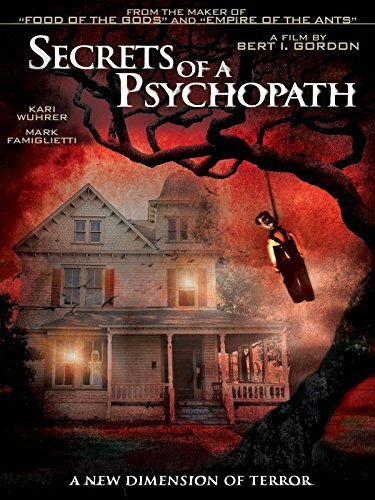 And Secrets of a Psychopath looks lushly terrific, a first-time digital effort from the man they call Mister B.I.G. for his larger-than-life creature features. But yikes. This thing stinks on so so many levels. This entry was posted in Strange cinema and tagged 2010s movies, terrible movies by Really Awful Movies. Bookmark the permalink. I’ll have to work that in a conversation soon! I think Wuhrer was in one of the non-Walken Prophecy sequels as well. I’ll take your word for it when you say this is a stinker, but Henry’s incestuous backstory sounds interesting in an Amityville 2 kind of way.